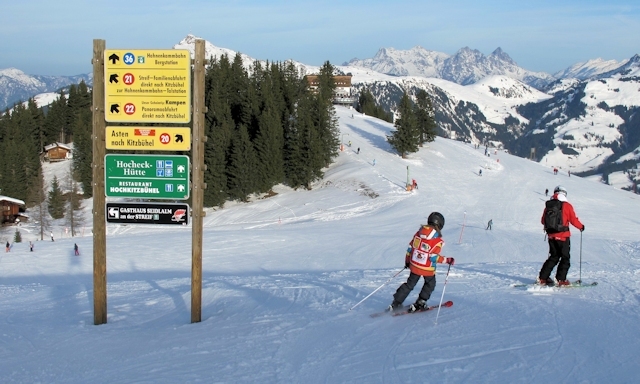 Kitzbühel is famous for its classic Hahnenkamm downhill race, but its a fairly easy run for the leisure skier and snowboarder, with some amazing views across the valley. In fact most slopes are pleasant intermediate fodder, the only downside being that the resort is so low that the conditions on lower slopes often deteriorate badly before Spring. The town is pretty, the apres ski good and the range of accomodation should suit all budgets. From the station in Kitzbühel a free ski bus meanders around the village to the bottom stations, the first being the small but boarder friendly Kitzbähler Horn, the second being the Hahnenkammbahn. 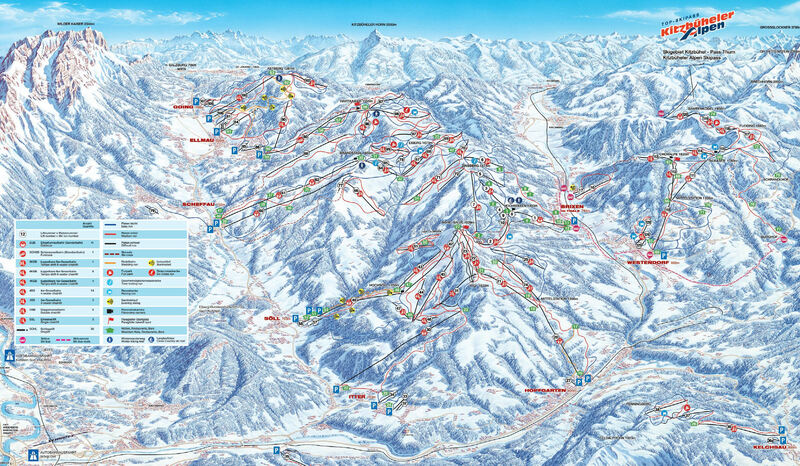 There is actually a railway station right next to the Hahnenkammbahn, named after the lift itself. Kitzbühel is a very easy day trip from Innsbruck, about an hour and a half via Wörgl and during the ski season there is a direct rail service from Munich. On the blue run towards the Pengelstein gondola station lies the Alpengasthof Schroll, a 400-year-old farmhouse with an amazing Tiroler gröstl ( +43 535 72344400). The Melkalm, just off the Hahnenkamm race piste, also does a mean Tiroler gröstl (+43 535 690980). For apres, The Londoner got voted one of the ten best in the world by the Daily Telegraph! 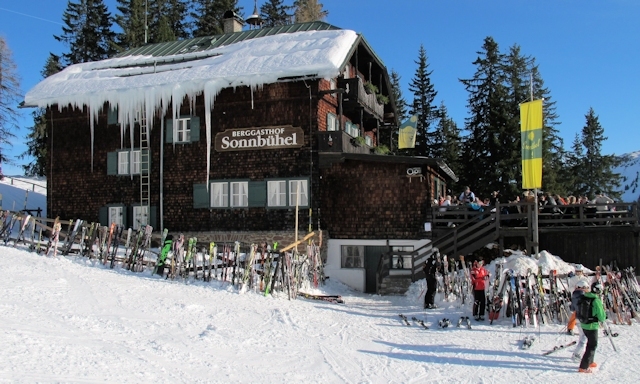 A-ROSA, Kitzbühel Voted Austria's Best Ski Hotel 2013 at World Ski Awards. Did you ski Kitzbühel or snowboard in Kitzbühel? What did you think? Have you taken the train to Kitzbühel? 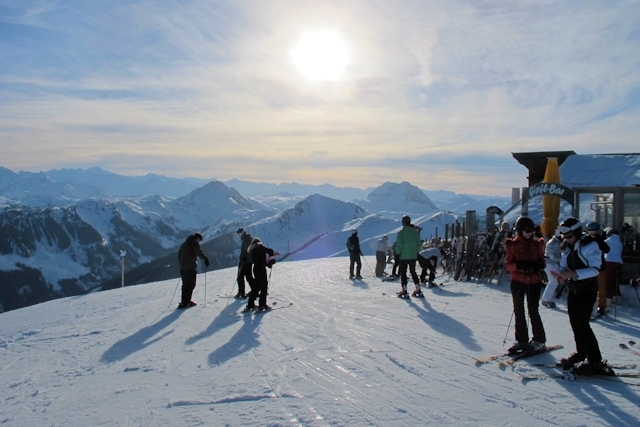 Do you have any tips on accommodation in Kitzbühel or the apres ski? Is there anywhere else you have taken the train to ski? if so, please contact us and share you experiences using the contact link at the foot of the page.